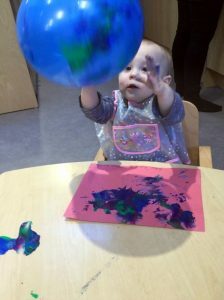 I can hardly believe that we have, last week, celebrated our second anniversary since opening Fairstead House Nursery. We have grown from three rooms to five rooms, however, please be assured that we will not be expanding any further to ensure that we maintain the warm, family atmosphere that we pride ourselves on. It is a continual source of pleasure watching our very youngest children at Fairstead House develop and flourish and it is hard to believe that our first intake into Foals will be starting Reception next year! 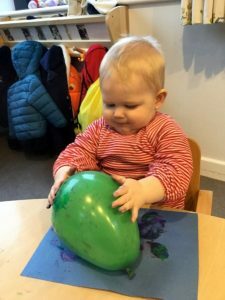 This week in Foals 1, the babies have been exploring balloons. 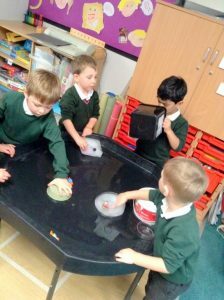 We have used them to practise our throwing, reaching and mark making skills. 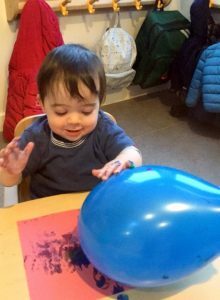 The babies had fun using the balloons and paints to create different marks on paper. We have been busy making orange scented playdough. 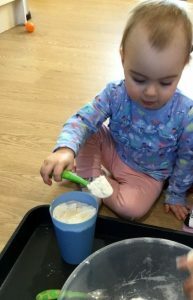 The children helped with the scooping, pouring and mixing until we had made a lovely, squishy and pliable dough. We added a few drops of orange essence and a small amount of food dye, and then it was ready for us to play with. 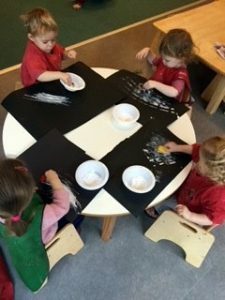 Yearlings have been busy mark making for our “wheels on the bus” display board. 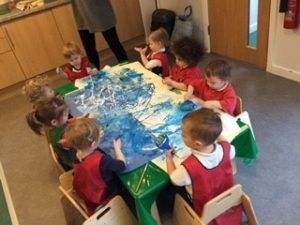 We painted the sky with rollers and paint brushes and used car wheels to paint the road for the bus. After all our mark making, we needed a well deserved break and snack! Please could we also remind parents to bring in family photographs for our room display? Thank you! 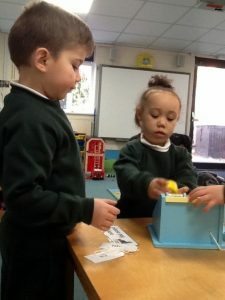 In Ponies 1, we have been exploring our new ‘supermarket’ role play area. The Ponies have been collecting various foods in the baskets and paying for the food at the till using pretend money. 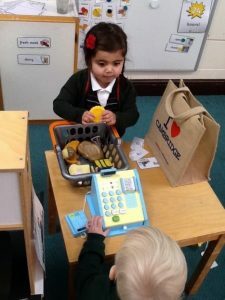 The children have enjoyed exploring the roles of a shopkeeper and a customer and using their mathematics and literacy skills when charging the customers for their shopping and writing shopping lists. 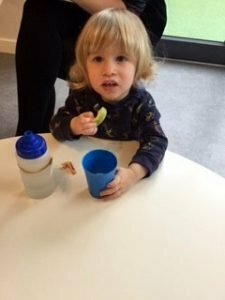 This half term, we shall be exploring winter for our topic, which developed from the children’s interest in ice skating out in the garden. 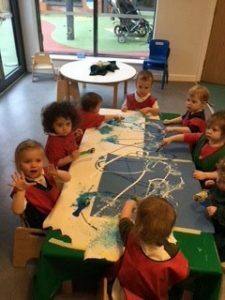 To start off this theme the children have been thoroughly enjoying their very own ‘indoor ice skating rink’ and sledding area, which they helped to put together. 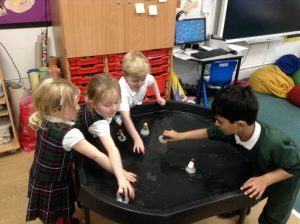 We have further explored ice by creating mini ice skating figures (small world figures frozen in water!) on the tuff tray. This has provided lots of wonderful discussion and vocabulary related to ice and why it melts. A gentle reminder to those parents who have not yet returned their Claim Form to access their children’s funded hours could you please do so by Monday 28th January at the latest. 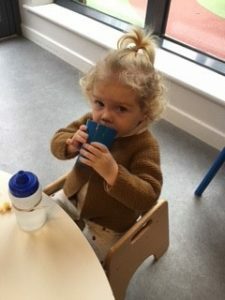 If your child will not be attending the Nursery for their usual session, please could you ensure that you telephone the Nursery before 10.00am to let staff know? Thank you very much. 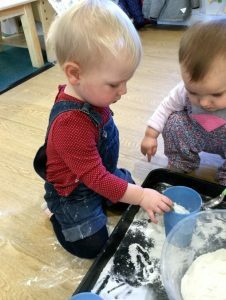 As the weather grows colder, please could you ensure that your children have suitable clothing such as hats, scarves, gloves or mittens with them in the Nursery. If your child is in either of the Ponies Rooms, then these should be purchased from the Uniform Shop here. A reminder that all Ponies should be in uniform, including the Fairstead House coat. We are delighted to announce that Mrs Beckett and her husband welcomed a baby son to their family last week. Mother and baby are doing well. Many congratulations to the Beckett family!